LONDON, October 2, 2017 — Oxford Properties, the global real estate arm of the Ontario Municipal Employees Retirement System (OMERS), and Madison International Realty have today announced that they are to acquire the Sony Center in Berlin for approximately €1.1 billion from NPS Korea. The acquisition marks Oxford’s entry into the Berlin market and an extension of its existing global relationship with Madison. The Sony Center is a 112,000 SQM landmark mixed-use complex located on Potsdamer Platz, in the heart of Berlin’s Mitte district. 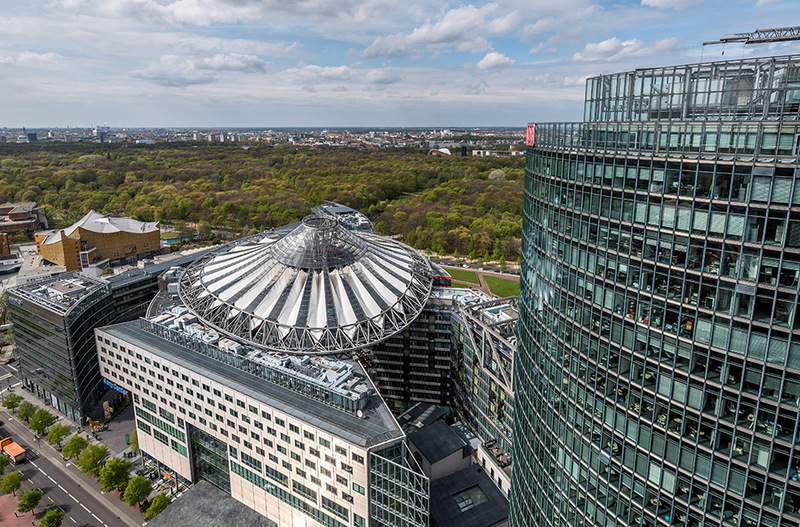 It spans nearly six acres and comprises eight individual buildings, including the iconic Bahn Tower, with 85,000 SQM of prime AAA office space, 20,000 SQM of retail and leisure space and 67 residential units. Major office occupiers include Deutsche Bahn, Facebook, Sanofi, Sony, the State of Berlin and WeWork, while retail occupiers include LegoLand, IMAX and Cinestar. Following the recently announced €500 million acquisition of Window in La Defense, Paris, this first transaction in Berlin brings Oxford’s Continental European assets under management (AUM) to approximately €2.3 billion, representing 40% of Oxford’s total UK & European AUM. The acquisition will complete in Q4 2017. CBRE and Greenberg Traurig advised Oxford and Madison; in addition, Freshfields Bruckhaus Deringer represented Madison. Hines advised NPS Korea. Oxford’s European portfolio now comprises 17 assets in London, Paris and Berlin with a combined value of €5.5 billion including St James’s Market, The Post Building and London Wall Place; King Edward Court and St Martin’s Court at Paternoster Square, Watermark Place, MidCity Place and The Blue Fin Building; as well as 130-137 and 48-50 New Bond Street and The Royal Exchange in London and Window, Paris Bastille, Avenue de France and Rue Blanche in Paris. Oxford Properties Group is one of the world’s premier real estate investment, development and management companies. Established in 1960, Oxford manages over C$40 billion of real estate assets on behalf of its co-owners and investment partners, with a global portfolio spanning over 60 million square feet. We have offices across Canada and in London, Luxembourg, Boston, Washington DC and New York, with regional investment, development and management professionals who have deep real estate expertise and local market insight. Oxford now has approximately C$8.2 billion / €5.5 billion of assets under management in Europe, with a focus on core office, high street retail and build-to-rent assets in Central London, Paris and Berlin. Oxford is the global real estate arm of OMERS, the pension plan for Ontario’s municipal employees. For more information about Oxford visit: www.oxfordproperties.com.